"Auto-racing, bull-fighting and mountain-climbing are the only real sports... all others are games." Ernest Hemingway's point when he said that was when genuine risk is involved in competition, an experience becomes more meaningful. By chance I had tried two of Hemingway's "real" sports, summiting the Matterhorn and driving a lap at 200 mph in an Indy race car. But bull-fighting long had eluded me. So when Professional Bull Riders, Inc. offered a chance to get into the ring with bulls weighing close to a ton, I didn't hesitate. Perhaps I should have. My venue would not be outdoors in Spain where Hemingway wrote "Death in the Afternoon." It would be indoors in Texas at a place called Billy Bob's. And I would not be bull-fighting in the traditional sense, with tights and a cape. Rather I'd be distracting bulls from attacking helpless riders once they were thrown -- a job traditionally known as "rodeo clown." For those who have never been to a live PBR event, the goal of a rider is to stay on a bucking bull for at least eight seconds with one hand strapped to the beast's backside. Once the rider is jettisoned -- or if his free hand touches the bull -- the clock stops and the scoring is tallied. Think of PBR bullfighters to bull-riders like an IndyCar pit crew is to racers -- for support. 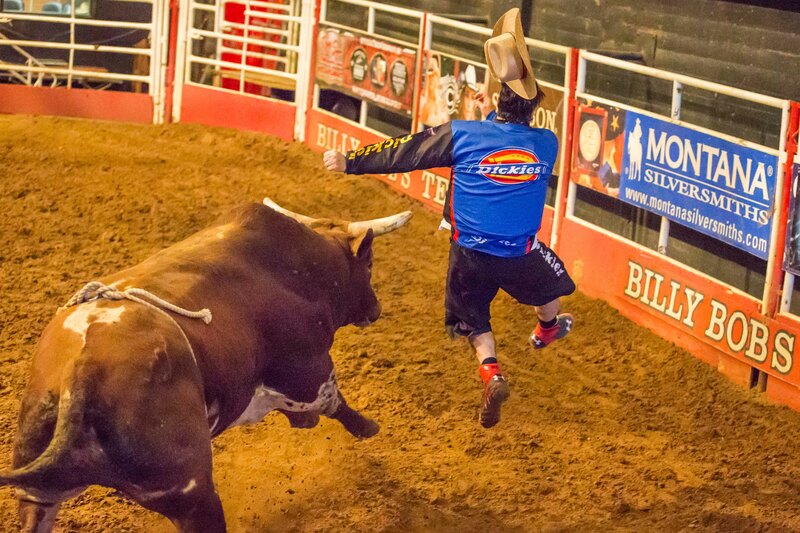 "We've got to get the bulls to chase us instead of the riders," says Shorty Gorham, 35, one of three bullfighters in the ring at any given time. For my bull-fighting experience, Gorham and "fearless" Frank Newsom were to be my coaches. First, they explained about the different types of bulls. Young ones tend to be mean but dumb; older veterans of the circuit are wizened but more docile. The most dangerous are older bulls who are still mean. "Like a pitcher's job is to know the batter, we've got to know the bulls," Gorham said. After signing liability waivers and changing into Dickies uniforms, we practiced in the dirt arena with a one-wheeled contraption which had a small bull's head attached. Gorham and Newsom simulated attacking me with it. The trick was to take an angle toward the charging thing, but not head on, then pivot immediately after clearing his horns. The idea is to render the charging bull powerless by running him in tight circles around you until he tires or another fighter distracts him away. It sounds easy, but it's not. "Today you're like a pre-schooler learning to write the letter 'A'," laughed Newsom, 39. "Hopefully you'll retain some muscle memory when the real bulls come out." After an hour of drills, I was deemed "ready." The first bull released was a six-year-old, Repo Man, who had a decent disposition as older bulls go. After he threw the rider, he lingered in the ring while Gorham and Newsom challenged him. They chided me to join in, which I tentatively did. I was scared, but tried to remember what they had just taught me. I had a few close encounters with Repo Man, one where the bull's horn even grazed my back, but eventually we got him back into the chute. The next bull out, Horny Toad, was more active. The four year old gave his rider a really good buck and, after he threw him, was definitely looking for more. First, he went after Newsom. But then, center ring, the beast zoned in on me. Some of my fear had waned and my adrenaline took over. We locked eyes and I took my angle, running 25 degrees to his right as he attacked. Fast as I moved, though, I came up a little short and couldn't get all the way around his huge head. Just like that, he flicked me with his horn as if I was a rag doll, launching me into the air (see photo). My next stop was the metal fence surrounding the ring. Stunned, I stayed down in the dirt a few seconds too long. Gorham yelled, "Get the 'expletive' up!" I grabbed my cowboy hat and scampered out of the ring, tail between my legs, before the bull could come in for seconds. My right arm was torn up with cuts and scrapes from the fence, and my left side felt like a Mack truck had hit me. My tailbone was severely bruised, too. The EMTs gave me the once-over, clearing me, but later on after X-rays they found I had three broken ribs. For all the risks, pay for PBR bull-fighters is modest compared to top riders like world champ J.B. Mauney, who can take in millions of dollars. Gorham makes less than $150,000 annually, out of which he covers travel and lodging on tour. As a group, though, riders appreciate the fighters' life-saving efforts. They collectively vote them in every year -- and that's good enough for Gorham. "It means they're confident in our abilities," he says. "When your life's on the line, politics don't mean a damn thing. You can't be a sissy and do this job."